Tennis players need plenty of complex carbohydrates before and after tennis matches to fuel their activities and recover from the demands of the sport. Unlike with aerobic exercise, your body burns mostly glycogen while you play tennis, so a higher percentage of your pre-match calories should come from carbs. Because matches can last several hours, players often need to eat and drink during competition. Knowing what to eat before your matches will help you hit the court properly fueled. Sports dietician Page Love, a consultant to the United States Tennis Association and the Women's Tennis Association, recommends tennis players keep three things in mind when eating before matches: Eat foods high in carbs, moderate in protein and low in fat; eat familiar foods; eat foods you can digest easily. 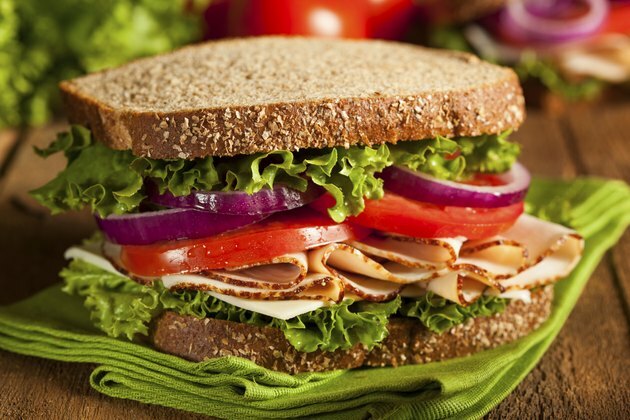 A sandwich with bread, lettuce, tomatoes, lean turkey and mustard instead of mayonnaise is an example of a nutritionally balanced, pre-match meal. Don't try foods or drinks you've never had before a match or practice, since you may have an adverse response to them. Stay away from high-fiber, high-fat foods that take longer to digest. Mix low-fat dairy products with carbs for a good pre-match breakfast. 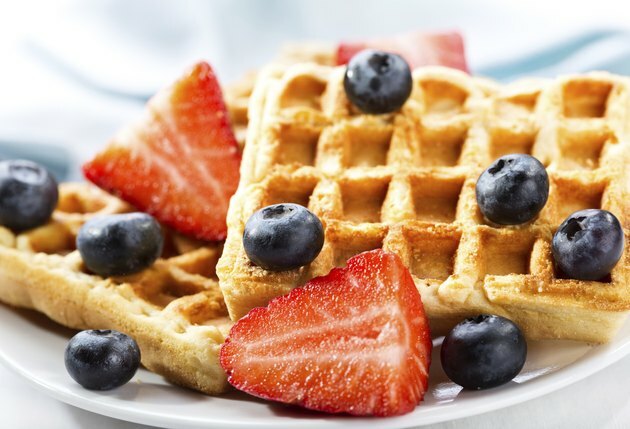 Try whole-grain bagels or English muffins, whole-grain cereals with skim milk, pancakes or waffles with fruit or yogurt. Bananas are high in potassium — an electrolyte tennis players lose when they sweat. Salads are high-carb and healthy, but the carbohydrates often don't include the starches that provide quick energy for tennis. 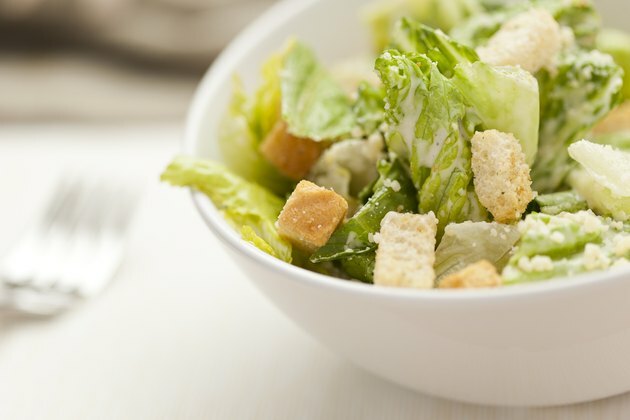 In addition to greens and vegetables, add whole-grain, baked croutons or serve pita bread with your salad. A sandwich with lean ham or turkey on whole-wheat bread with non-fat mayo or mustard and greens is a good pre-match choice. Try a baked potato without the cheese, bacon, butter and high-fat sour cream. Add fat-free salsa, guacamole or sour cream. Kiwi is high in potassium and a sweet dessert option. If you're playing in the evening, have an afternoon snack and early dinner so you won't be full when you hit the court. 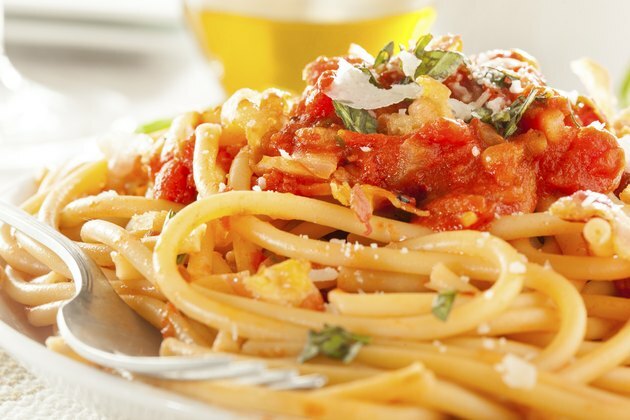 Pasta with a meatless marinara sauces is a good choice for tennis players. Sprinkle on some low-fat Parmesan cheese for protein. Two slices of meatless pizza will also provide you with carbs with much less fat than a pepperoni or sausage pie. A stir-fry with rice, plenty of vegetables and chicken breast or lean beef provides a good combination of nutrients for tennis players. Have a fruit salad for a light dessert. Serve a small, fist-sized piece of salmon with a side such as grits, black-eyed peas, lima beans, corn or beans.